Pujyasri Aathmanandamayi Maathaji the founder MOTHER of Divya Babaji Sushumna Kriya Yoga Foundation is a divine guru who is initiated into Sushumna Kriya Yoga by Parama Guru Sri Sri Sri Bhognatha Siddar, in the presence of ever youthful golden bodied Parama Guru Sri Sri Sri Mahavatar Babaji in the Brahma Muhurtham time (early hours before sunrise), on the sacred festival day of Vinayaka Chathurthi, Wednesday, the 7th of September 2005. At the behest of both the Gurus Pujyasri Aathmanandamayi Maathaji undertaken the task of enlightening and liberating Sushumna Kriya Yoga practitioners. She leads a simple life that of a householder performing all her duties as a (Gruhasta) Homemaker, sets an example and proves to the world and to all her disciples that one need not go to the Himalayas or runaway from worldly responsibilities to attain (Moksha) enlightenment and liberation. One can lead a normal family life, and still practice meditation and attain (aathmananda) blissful state of soul. She loves all her disciples like a mother and strives hard for the spiritual growth of her disciples. 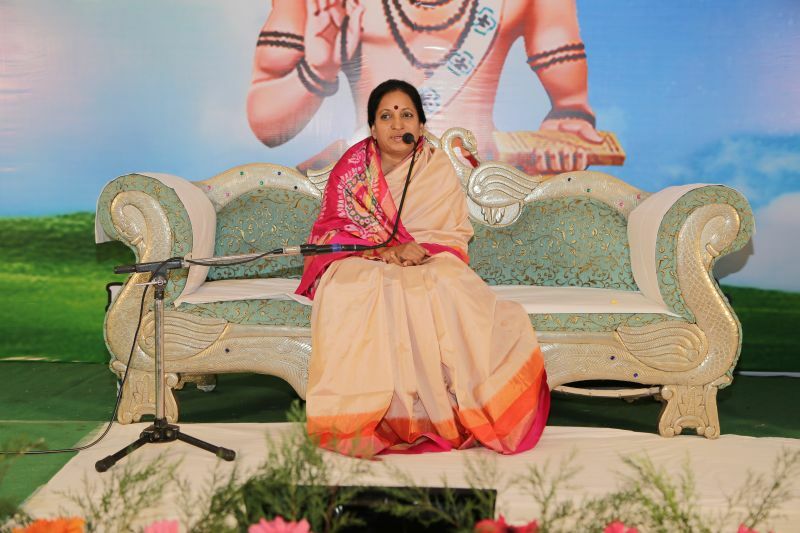 She is directly accessible to all the Sushumna Kriya Yoga Meditation practitioners for doubts and advanced guidance in their spiritual path. She conveys that one should balance spiritual world and material world judiciously. 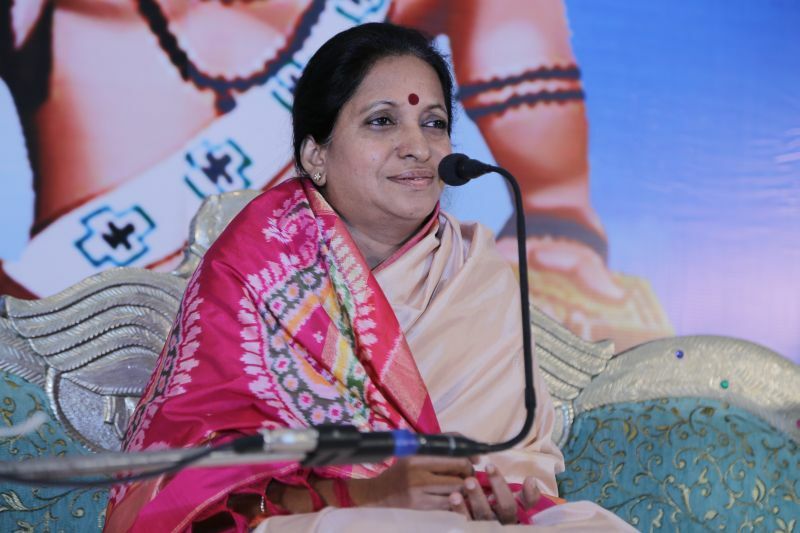 She asserts that Sushumna Kriya Yoga meditation is an essential tool for each and every human being to overcome the day to day challenges of modern life with ease and ultimately attain aathmananda (ever lasting bliss). 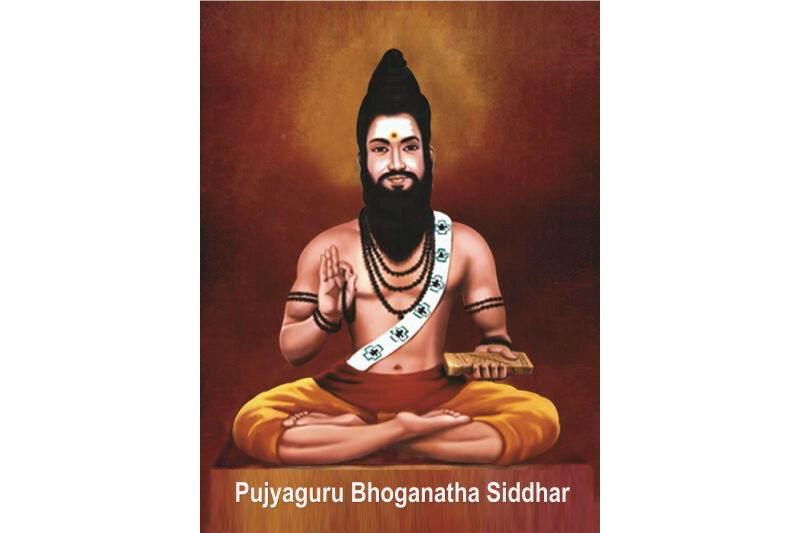 Parama Guru Sri Sri Sri Boghanadha Siddar is one among the eighteen sacred Siddars. The books of the ancient ascetics show that the life of Sri Sri Sri Bhoganatha Siddar spanned for more than twelve thousand years, starting from even before the beginning of Kaliyuga. He obtained initation (upadheysa) on all forms of Meditational practices from his revered Guru Sri Sri Sri Kalinganadha Siddar. As part of his spiritual education, he became an expert practitioner of the Kayakalpa Chikitsha (for enhancing one’s life span). With the aim of attaining Lord Subramania's Holy grace, Sri Sri Sri Bhoganatha Siddar meditated on the hills of the Sathuragiri and Sivagiri. At the age of 14, Sri Sri Sri Boghanadha Siddar was shown the “Saakshatkara”(Apparition) of Lord Subramania at Cuttralam. He later shifted his practice to Kandi Katirgamam in Sri Lanka, before moving onto the Palani Hills in Tamil Nadu, India where he practiced Yoga and Meditation for many years. Sri Sri Sri Boghanadha Siddar created and installed the “Navapashana” idol of Lord Subramania at Palani. 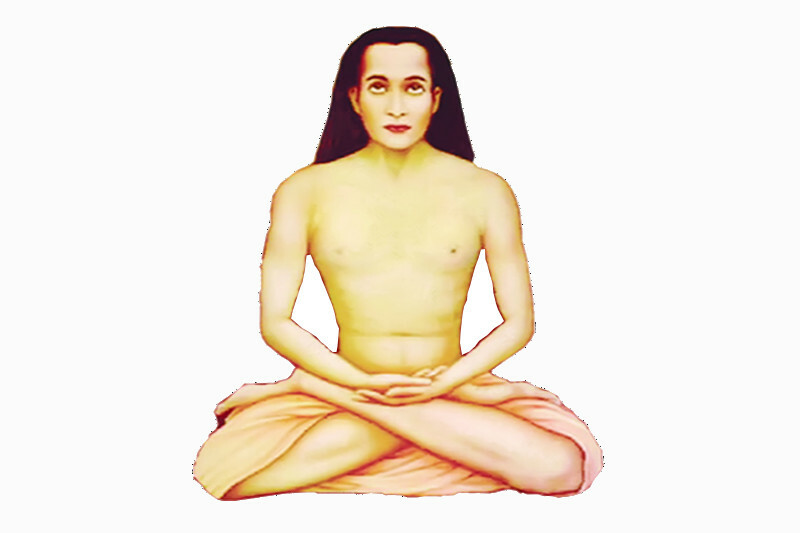 At Katirgamam, Sri Sri Sri Boghanadha Siddar initiated Sri Sri Sri Mahavatar Babaji into the practice of Kriya Yoga Sadhana. Before the start of Kali Yuga, Sri Sri Sri Boghanadha Siddar, with the aim of uplifting the common man from the darkness of the shroud of ignorance and the cloak of Maya that confounds the human being from his earthly existence, initiated the confluence of ideas through discussions with numerous spiritual masters. The result of such a massive Divine Exercise manifested in the form of Sushumna Kriya Yoga meditation that shall awaken us to our Divine Self and help us attain the state of utmost bliss – being One with God. Gautama Buddha, near the end of his life, in the 5th century BC, predicted that his teachings would be distorted and lost within 500 years and would be rediscovered in 800 years and preserved by one whose name would be associated with the term "Naga". In the year 203 A.D on the 30th (Kartheeka Pournami) day of November , in a small village known as Parangipettai, in Tamilnadu, India a child was born. This child was named Nagaraj, who subsequently blossomed into the great Sidda Yogi known today as Babaji. Nagaraj being the son of the village's chief priest in his early formative years must have been greatly influenced by the personal religious practices of his parents and the public ceremonies and celebrations associated with Temple life. When Nagaraj was five years old a kidnapper took Nagaraj on a sailboat to Calcutta and sold Nagaraj to a wealthy man as a slave. His owner was a kind man and liberated nagaraju from slavery and gave freedom. At the age of eleven, Nagaraj made a long difficult journey by foot and by boat with a group of scholar ascetics from Benares to the sacred shrine of Katirgama, Srilanka. Nagaraj met Sidda Bhoganathar at Katirgama and became his disciple. Sitting under a large banyan tree with Bhoganathar Nagaraj obtained spiritual initiation into the practice of Kriya Yoga. After the strict and prolonged practice of various yogic and meditational practices under the guidance of Sri Sri Sri Bhognath Siddar, he attained oneness with God at the young age of sixteen years. He has since retained this immortal physical body for centuries. However, he remains invisible in the Himalayas and guides millions in their spiritual quest. When it is required he chooses to materialize in a suitable form for the sake of his disciples.